All the dog tags used are hand cut from raw aluminum then rounded and sanded, the brass is naturally aged and hand embellished and the leather is of the highest quality, all hand treated and waxed by Trevor himself. The goal is to create lasting, impressionable pieces that have their own unique character. Trevor also allows you to customize pieces with monogramming or short phrases which he hand stamps individually using metal lettering and a good 'ol hammer. A true craftsman, Trevor revels in the fun and challenge of sourcing and working with various metals, jewels and leather. It's an ever evolving craft and I'm excited to keep track of his journey. 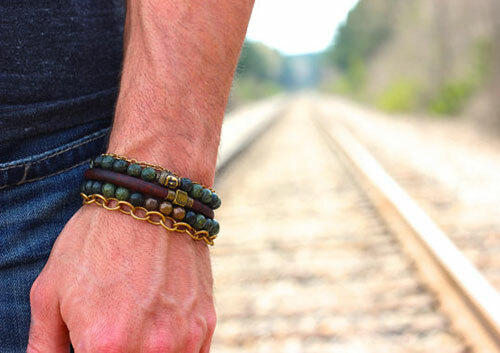 See his latest venture into apparel, here and click here to see the entire Rustic Brand collection.